This article will provide an in-depth review of the Whirlpool 36-inch Counter-Depth Side-by-Side Refrigerator. Highlights of this review will include the product’s features, specifications, price points, user reviews, pros and cons, and comparison to the competition. Buying a fridge of this caliber likely means you have several mouths to feed, whether it’s your family or people you like to entertain regularly. Because choosing the perfect fridge for your home is not a task to be taken lightly, this review will remain unbiased and thoughtfully honest from beginning to end so that you can make a well-informed buying decision. 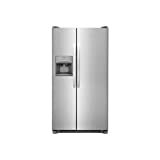 The Whirlpool WRS571CIDM model fridge is one of many of the brand’s well-known lineup of refrigerators. This family-friendly model features an In-Door-Ice® Plus system that offers crushed or cubed ice and eliminates the need for a bulky ice machine taking up space in the refrigeration compartment. There’s also an adaptive defrost feature that saves energy by monitoring compressor activity and defrosting only when required. The fridge is also known for cooling food quickly thanks to its Accu-Chill™ temperature management system. This Whirlpool fridge also features LED interior lighting and a high-end air and water filtration system. The standout features of the Whirlpool refrigerator include four freezer shelves, three adjustable full-width door bins, three adjustable full-width standard glass shelves, counter-depth styling that brings the classy built-in look at a fraction of the price, the through-the-door ice and water filter, and adjustable gallon door bins. The two-door design, frameless glass shelves, and hidden hinges make for simple organization, while the stainless-steel finish makes for a sleek and stylish appearance. There’s also one humidity-controlled crisper drawer and two non-climate control drawers. The fridge’s air and water filtration system are also considered high-end, featuring a FreshFlow™ air filtration system, which is considerably more efficient than using a baking soda container, and a PUR® water filtration system that can eliminate the use of up to 3,000 plastic bottles a year. The replacement filters for this fridge are remarkably easy to find. Whirlpool also received an acceptable Energy Star® rating for its energy efficiency. The fridge’s frameless glass shelves make for sleek interior design and easy visibility when you need to determine the freshness of your perishables with just a quick glance. Without door and handles: 24 ½ in. With door at 90 degrees: 45 7/8 in. Without handles: 27 ½ in. Without hinges: 68 5/8 in. 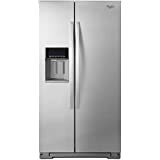 The Whirlpool fridge’s manufacturer-suggested retail price is currently available on whirlpool website, putting this fridge firmly in the affordable category from both ends of the price spectrum. This Whirlpool fridge model can be found at stores like Sears Outlet, Designer Appliances, Amazon, BestBuy, AJ Madison, Lowe’s, Home Depot, Appliances Connection, and JC Penney. This 26.0 cubic-foot, side-by-side fridge features an external water dispenser, built-in air and water filters, and outer digital temperature controls. It also has an open-door alarm that prevents food from spoiling if you accidentally leave the fridge doors open. The fridge’s design also features spill-proof shelves, gallon storage in the door, and the trendy stainless-steel finish. Electrolux’s simple two-door design and plainly laid-out organization make for considerable ease of use. This fridge features IQ touch controls for those who like a high amount of visibility when selecting refrigerator options. Additionally, the fridge’s simple two-door design adds to the high ease of use rating. Like most refrigerators, the Electrolux’s average installation time is approximately one hour. If you choose to have the water dispenser active in your home, you will need to purchase a waterline kit and have it installed, which may add to the total installation time. However, many of today’s refrigerators include an ice and water dispenser that required a waterline, which is factored into the average installation time. Unfortunately, Electrolux is known for needing constant filter and icemaker replacements over time and having shelves that are generally difficult to remove. Although the exterior has a polished, clean-looking finish, the interior setup leaves quite a bit to be desired according to some buyers. Some users also complained of temperature regulation problems for both the fridge and freezer compartments. While most refrigerators come with a subpar one-year warranty for parts and labor, the Electrolux fridge boasts a hearty three-year warranty, beating the Whirlpool model by a longshot. Electrolux also offers the opportunity for buyers to extend the warranty at no additional cost. Frigidaire is one of the most popular refrigerator brands on the market today. This particular model features adjustable interior storage, two humidity-controlled crisper drawers, a stylish counter-depth design, a filter change alert system, a spacious deli drawer, and spill-proof glass shelves. A stainless-steel finish completes the aesthetic with a stylish, sophisticated flair. Thanks to interior LED lighting, a simple two-door design, and straightforward organization, the Frigidaire-brand fridge is generally simple to use. The front-door digital controls are easy to understand and therefore add to the fridge’s high usability rating. The childproof setting on the exterior dispensers is also easy to configure. Overall, this fridge can be effectively used by just about anyone. Most refrigerators take about an hour to be installed after delivery, and the Frigidaire fridge is no exception. The ice and water dispenser will require the installation of a waterline kit if your kitchen has a usable waterline. Waterline kits can be purchased at most appliance stores. The fridge’s cubic footage also makes for relatively easy delivery to your home, depending on your home’s available entryways. While visually pleasing on the outside and inside, the Frigidaire fridge has received numerous complaints from buyers regarding excessive noisemaking, frequent repairs, and occasional leakage even after repairs. Some users have also complained of an unsatisfactory water dispenser that doesn’t disperse cold water or let it out fast enough. Fortunately, the easy pull-out shelves are accurately advertised, making for easy cleanup and organization. Like many standard refrigerators currently on the market, the Frigidaire-model fridge comes with a one-year warranty for parts and labor. Because this fridge offers the same warranty as the Whirlpool fridge, we had to give its warranty an average rating of three stars. This 36-inch, 21.9 cubic-foot refrigerator consists of a through-the-door water dispenser, adjustable shelves, a built-in water filter and icemaker, touchpad controls, and childproof capabilities. Completed with a stainless-steel finish, the Amana fridge will be just as stylish in your home as any other comparable fridge. The Amana fridge’s large storage capacity, effective LED interior lighting, and Temp Assure™ freshness controls are just a few of the features that make this fridge easy to use for most consumers. The adjustable door bins make for personalized storage and easy cleanup, while electronic temperature controls have been reviewed by users as easy to use and understand. Because of this fridge’s average size and need for a waterline and waterline kit, installation time is estimated at the one-hour standard. If buyers decide not to purchase the waterline kit, the ice and water dispenser will remain unusable, but the installation time will be shortened. Like most fridges, you really can’t go wrong with including delivery and installation with your purchase. Some installers have also claimed that the Amana fridge is remarkably easy to install compared to other models. Those who lay eyes upon the Amana-brand fridge will likely notice its sleek outer appearance first. The stylishness of this fridge is undeniable, and for the price range, it’s a tough model to beat. The interior of the fridge is also of high quality, featuring easy-to-remove adjustable shelves and gallon storage in the door that makes for space efficiency throughout the rest of the fridge. 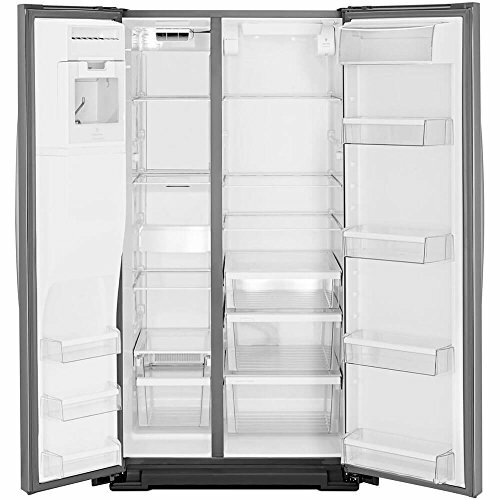 Like the Whirlpool and the Frigidaire fridge models, the Amana fridge comes with a standard one-year warranty for parts and labor. Although this is standard for appliances such as refrigerators, as reviewers, we’re really hoping to see more refrigerator brands rethink the one-year warranty policies in favor of something more flexible. The positive traits of the Whirlpool-brand fridge include the universally-fitted counter-depth design, the high-end, energy-efficient LED interior lighting, its relatively affordable price point, and easily removable shelves and drawers for easy cleaning. Users also love the sleek, polished finish of the exterior. Another positive for the Whirlpool fridge is the brand’s responsive customer service team. The downsides of the Whirlpool fridge include doors that are prone to rust, a slow icemaker, and lack of freezer storage space. There is also the issue of compressors that occasionally run loudly and require a professional to fix. The Whirlpool fridge does have some considerable flaws, but it’s still a worthwhile purchase overall, especially for the price. If the fridge were a few hundred dollars more expensive. Your family and guests are bound to be impressed by this well-rounded, luxurious-looking fridge model. If you’re one of the lucky buyers who don’t need to contact repair companies on a regular basis (or at all), then you can expect a lot of life and longevity out of this refrigerator. We might have had to reconsider a four-star rating when considering the overall quality of the fridge and rate of user issues with the product, but the price point of this model is perfectly acceptable for what you can expect out of this fridge.